James Krulder was honored for his work in the Global Mobility Industry at the Forum for Expatriate Management’s annual award ceremony, the 2016 Americas EMMAs. James Krulder (right) after accepting his award. FEM looks for individuals who have been recognized by their colleagues as having made a significant impact at the beginning of their career, showing they are the future “movers and shakers” of the industry. 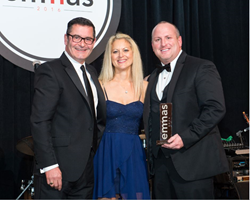 The Director of International AutoSource, James Krulder, won the "Global Mobility Rising Star of the Year" award at the Forum for Expatriate Management’s (FEM) annual awards, the 2016 Americas EMMAs. The award ceremony was held on May 5, 2016, in Philadelphia, PA. At the awards, International AutoSource was also given Highly Commended recognition in the category of Employee Benefits and Services Provider of the Year. The FEM Americas EMMAs celebrate the best and the brightest of the global mobility industry. This was James’ third nomination in the category; in 2015, he received an honorable mention. James entered the global mobility industry in 2012 as the General Manager of International AutoSource, an Expat car program offering car leasing, financing, and rental solutions without a local credit history. Since then, he has committed himself to growing the programs and services offered, improving the overall Expat experience. The Global Mobility Rising Star of the Year award is given to an individual who has been working in the Global Mobility Industry for 1-5 years. FEM looks for individuals who have been recognized by their colleagues as having made a significant impact at the beginning of their career, showing they are the future “movers and shakers” of the industry. For over 50 years, International AutoSource has been providing value-added services and benefits specifically designed for expatriates and the global community for short and long-term assignments. Their programs offer full-service personal transportation solutions for financing, purchasing, leasing and rental without a local credit or driving history. Through outstanding service, value and support IAS strives to make assignments into a foreign country as seamless as possible while saving customers valuable time, money and resources. For more information, please contact International AutoSource at 516.496.1816, email at intlauto(at)intlauto(dot)com or visit their website http://www.intlauto.com.